Recipe submitted by Katie Taylor, Chief Customer Officer, Sara Lee Branded Apparel (Hanes). 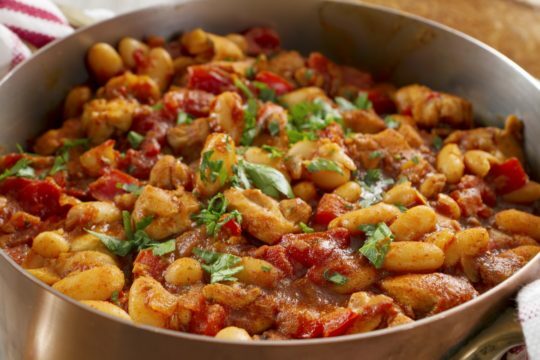 Try this healthy and great-tasting twist on your favorite chili recipe. White Bean Chili is full of calcium and healthy nutrients, and a good source of complex carbohydrates. Add hot sauce, kidney beans and chicken breasts for a “five alarm” taste! Poach in 2 cans chicken broth for approximately 15 minutes depending on size. Chicken should be fully cooked, not pink in middle. Keep at a very low simmer, otherwise chicken will be tough. While chicken is poaching, combine chicken broth, white northern beans, white kidney beans, cumin, oregano, chili powder, cayenne pepper and hot sauce in a 6-quart stock pot. Sauté garlic and onions in olive oil until tender. Add green chilies and sauté 2 more minutes. When chicken is poached, let cool and cut or tear into bite-sized pieces. Add chicken to chicken stock mixture. Cook for at least one hour and serve.